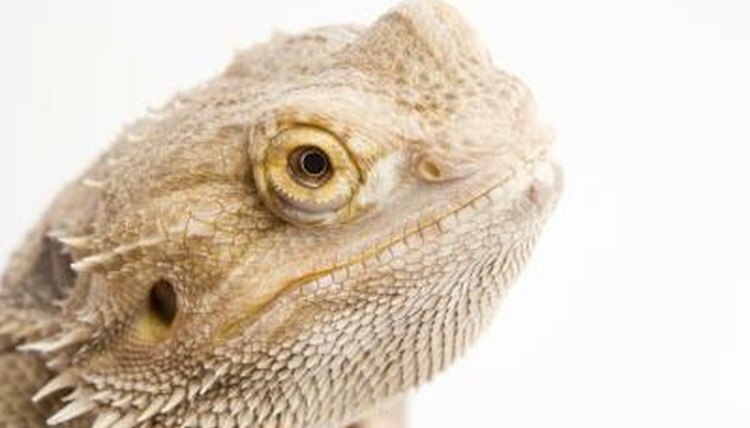 Is It Normal for Bearded Dragons to Have Their Eyes Bulging? Don't be startled when your bearded dragon bulges out his eyes.This behavior is common with bearded dragons, though no one is exactly sure why the lizards engage in this behavior. A few theories exist to explain eye-bulging, but there is no consensus for the action. Bearded dragons are small, spiny, tan or yellowish lizards belonging to the genus pogona. The species most commonly kept as pets is Pogona vitticeps, the inland bearded dragon. Bearded dragons get their common name from the spiny scales that coat the skin over their throats like whiskers and their ability to flare out this skin when either threatened or displaying dominance. They have flattened bodies with long tails and wedge-shaped heads with eyes on each side that are usually flattened and set deep in the sockets. From time to time, you'll see a bearded dragon's eyes bulging out of their sockets, stretching out the lids and skin around the eyes. This normally lasts only a moment before the eyes return to their normal shape; sometimes it happens so quickly that owners fail to notice the behavior. Among a few theories to explain this behavior, one of the more doubtful is that it’s the lizard’s way of yawning. One of the more predominant theories regarding eye bulging is that the dragon does it to loosen the skin on the eyelids and around the eyes in preparation for shedding. Because this behavior tends to occur more frequently in young dragons, who shed more frequently than full-grown bearded dragons, this theory tends to make the most sense and is the most widely accepted explanation. While eye-bulging is normal behavior, it can sometimes be a cause for concern. Another theory for its occurrence is that it’s related to high blood pressure. Some lizards, such as the horned lizard, have the ability to intentionally increase the blood pressure behind their eyes as a defense mechanism; some scientists believe the bearded dragon might possess this ability. If your bearded dragon displays this behavior for more than an hour at a time, he needs to see a vet to make sure his blood pressure is at a healthy level. Do Geckoes Shut Their Eyes When Asleep? Why Does My Chinese Water Dragon Always Keeps His Eyes Closed? Do Lizards Bleed When the Tail Comes Off? Why Do Deers' Eyes Glow?